ON THE MARCH Members of Engineers and Scientists of California union are asking Sonoma County for better pay and help with recruitment and retention. What does a single mother with three kids, a master's degree and 27 years of experience as a physical therapist have to do in order to pay the bills? Apparently, find a job in a better paying county. Mary Bertling is a member of the Engineers and Scientists of California union (ESC), and her plight is not uncommon among top-tier health practitioners in Sonoma County. Bertling is passionate about her work and the people she works with, but, she says, "I just can't sacrifice my own kids much longer for the sake of other people's." On July 12, Bertling and other ESC members gathered in front of the Sonoma County Board of Supervisors to continue their ongoing fight for better pay and push for higher recruitment and retention rates for the union. There are 252 employees who work under the ESC umbrella in the county, according to the county website. ESC members and supporters addressed the supervisors and told stories of how much the union's work benefits local children—and implored the board to step up and pay the union workers what they deserve. 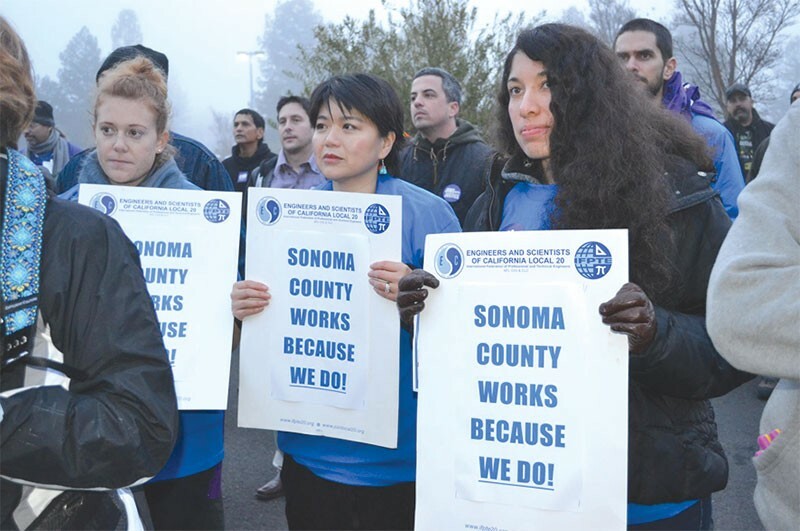 The latest wage fight in Sonoma is similar to the recent SEIU Local 1021 fight for better pay. That effort saw county workers go on strike for four days as they tried to leverage better pay for lower-tier healthcare workers who provide in-home support services throughout the county. "I think there is a direct connection between the county workers' strike and the bargaining at ESC Local 20," says Marty Bennett, co-chair of North Bay Jobs with Justice. He sees intersecting issues between the two unions, such as understaffing, low morale and falling retention rates among the workers, and the impact that has on the overall quality of the services that are provided to residents. Bennett's organization plans to host a workers' rights board hearing on Aug. 13, where members of ESC will highlight the critical services they provide the county. Lis Fiekowsky, business agent for ESC Local 20, says that while the respective union battles share a similar arc, the county needs to do a better job at distinguishing between the work that each group performs. "The county is actually using the SEIU negotiations as a framework for the bargaining concerning ESC Local 20," Fiekowsky says, "but Local 20's population is a different group than 1021." She adds that the union is pushing Sonoma County away from a "one size fits all" approach to the negotiations, and prioritizes the Local 20 members whose work, she says, keep Sonoma County healthy and safe. The distinction can be seen through the wages each group typically earns. The in-house support workers pushed for a $15 hourly wage and settled on $13.10, but ESC workers earn significantly more than that: hourly rates range from a bottom end of about $30 to a top tier of over $94 for county psychiatrists. Worker retention is a key concern of Local 20, given that they're among the last batch of county workers still negotiating a new contract following the 2008 economic crash. "All the other unions have completed bargaining and ratified their contracts," Fiekowsky says, adding that they've also "gotten new healthcare options and better county contributions." Bargaining over the Local 20 contract began last December, a few months before the contracts were to be renewed in February. The strategy was obvious: begin the bargaining process before the contracts were renewed to improve the terms for the workers. Now it's late July, and the bargaining is ongoing. Like many contract negotiations these days, ESC workers continue to be saddled with concessions and agreements that were made during the Great Recession. When Sonoma County was facing down a budget crisis wrought by the 2008 crash, workers agreed to over a week of unpaid furlough to help the county deal with the crunch. Even as the economy has improved, the furlough days have not been lifted, and the healthcare workers have seen an overall 2 percent cut to their paychecks as a result. They're asking for a 3 percent cost-of-living (COLA) increase on top of a 5 percent hike to the hourly rates, to bring Sonoma County in line with what other counties pay for the same services. The county has budged on the COLA increase—offering 2 percent—but the bargaining team hasn't been able to get the supervisors to move on the mandatory furlough days. "While we have maintained strongly and clearly that the final agreement needs to include an economic package that allows Sonoma County to recruit and retain the important public service providers that keep our community healthy and safe," says Fiekowsky, "the county's behavior at the table has been somewhat erratic, making it difficult to find a solution that meets our needs and theirs." Reached for comment, supervisor Susan Gorin says she can't discuss the ongoing negotiations. The negotiations have spanned 20 meetings between the union and the county, whose Employee Relations Division of the Human Resources Department notes that county officials have indeed made some concessions along the way to a better package for the union workers. "The county has proposed an economic package similar to that negotiated with other bargaining units, which includes [a] two year agreement with annual COLAs, an additional employee pension cost-share with an equal offset for legacy employees, a substantial increase in county's health insurance contributions, minor enhancements to benefits, and 0.5 percent [in] one-time money." The county also notes that its proposed increases in health insurance contributions is the functional equivalent of a raise, as it "represents an average of 6 percent, and up to 14.6 percent for some classifications, increase in gross wages for employees enrolled in family level insurance coverage." Natalie Hall, a union member who sits on the bargaining team, says she sees negotiations drawing to a resolution soon. "We have a confident and great team, and we're on it," she says. "The reason this bargaining team has worked is because we are all very good at different aspects of the process." Hall is a behavioral health nurse in the county's crisis unit and works with people who are under observation because they might do harm to themselves or others. The demands of the job, she says, make it critical that workers are performing at their best, "but the workers cannot be at 100 percent when they have to work three jobs just to live in the county," she says. "Hopefully, the county will see a lot of us are struggling to make it. I have my master's, but I have to work three jobs just to have a home."